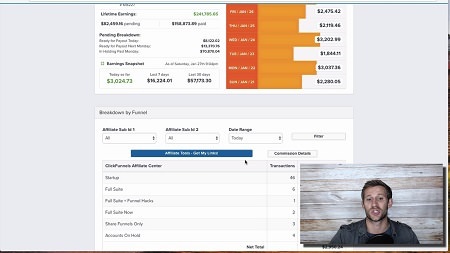 Watch the video below if you are interested in creating a passive income. - Adwords: Complete 8-section course for beginners or novices. With Adwords you can find people already looking for ClickFunnels products! - Instagram: Coming soon! How I drive affiliate offers on Instagram on complete automation. I'm talking 100% automated. - Facebook ads: How to actually succeed with Facebook ads instead of blowing your money "bootcamp style". - Access to my 50+ emails for every product I promote. Just plug them in! - White label my entire ClickFunnels course that I offer as a bonus. One click and it's in your ClickFunnels account! - Easy access to my highest-converting funnels. One click and it's in your account! - Facebook group of high-powered ClickFunnels affiliates that know how to win.